Who am I and what is this project all about? Knowing what should go into the garden at different times of the year can be tricky. It certainly takes a lot of practice to remember it all by heart but there are some resources out there that will help you get it all right. You can buy “Sow What When” charts which are great for a quick and handy reference. I keep one on the back of the laundry door because that door leads out to my vegie patch. I don’t refer to it very often these days but, it seems to come in handy for my house guests. I often find people scanning through it on their way outside. There are probably others but these are the main ones that I know of. On the topic of what should be sown now – I have been sowing peas and broad beans this week. I have a number of beds where I grow each of them. This allows me to sow blocks of them every fortnight or so. This helps to stretch the harvest over the fruiting season. I’ll do this from now until July and they should be ready to harvest about 10 weeks after each sowing. This is my latest posi for my peas and beans. If you look carefully you can see that I have just extended this bed into the lawn area. It was previously a narrow bed that housed my cucumbers and zucchinis. I decided to make it wider to accommodate both my peas and some extra broad beans. 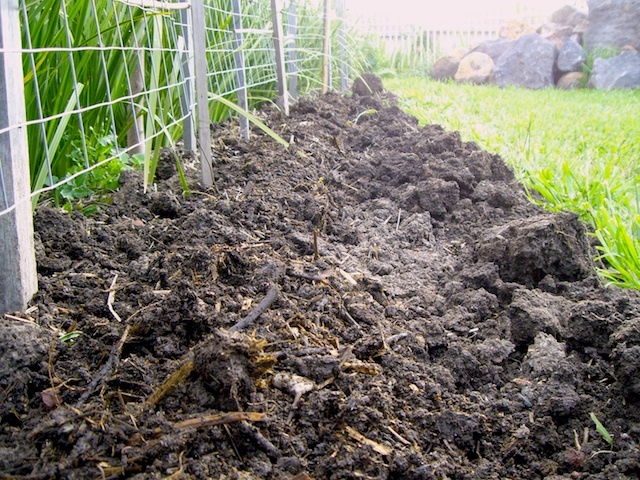 I just have to add a bag of sheep manure to that soil and it will be ready for sowing... better go soak some more seeds! I soak my peas and beans in water with about 1/4 tsp of epsom salts (no more!). Soak them for about 12 hrs. The peas will take up the magnesium in the epsom salts and this will kick start their growth. Soaking the seeds overnight will speed up the germination process so you’ll see things popping up through the soil very quickly, within about 5 days of sowing. I like to do this with the larger seeds like peas, beans and corn. Before you sow peas and beans do a quick soil soil test. If your pH reading is below 7.0 you can add a bit of dolomite lime and, if you have some handy, a bit of mushroom compost. This will raise the pH so that it is slightly alkaline which is a more favourable growing environment for your peas and beans. Enter your email address to follow everydayinythegarden and receive notifications of new posts by email. The Fruits Of My Labour – Or Not! Fungi – it'll grow on you!